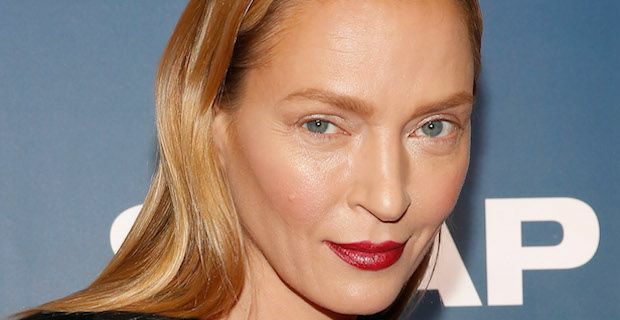 Uma Thurman appeared at a red carpet event last night with a completely new face and you honestly would struggle to even recognise the Hollywood star. The star certainly turned heads as she attended the premiere of her new TV series The Slap in New York City. 44 year old Thurman has long been known for her beauty as she appeared in a string of hit films from Pulp Fiction to Kill Bill. However, she definitely looked a lot different than usual last night as the smoothness of her forehead and overall puffiness of her face had tongues wagging that she has engaged in some cosmetic surgery recently. Speculation is rife online with many people believing Uma has had some botox on her forehead along with possibly some surgery to tighten up the skin around her eyes. Twitter users have been busy posting their disbelief at Thurman's new look with @heretotellit tweeting "Nah man....that can't be Uma Thurman .....not gonna believe it till I see her speak. Wow" and @larryents saying "Looks like Uma Thurman wouldn't even win an Uma Thurman lookalike competition any more." However, the devil may well be in the detail with many people quick to point out that the actress was not wearing much make-up around her eyes. This is unusual for her as she often uses mascara in this area to make her eyes pop and look as distinctive as possible. @Maddy.R_Smith was on point to remind people of this by tweeting "ITS JUST DIFFERENT MAKE UP LEAVE HER ALONE". Renée Zellweger made headlines all around the world when she appeared at with a drastically different appearance at ELLE's 21st annual Women In Hollywood Awards last year. Thurman's transformation is slightly milder when compared to that of Renée's but it is shocking to her fans none the less. Is Jeremy Clarkson hitting the Silver Screen soon?